I actually love Summer. Well maybe I should say, I love Summer weekends, since I don't really get to go outside during the week. I pack my Summer weekends to the brim with trips to the dog park, outdoor movies, music festivals, anything associated with water (including but not limited to: pools, lakes, slip-n-slides), patio drinking, flea markets, and road trips. So I need clothes that change from one activity to the next right there with me. 7. I get cold… a lot! 3. The owners love pugs too! I love my posh'mina & the lovely ladies over at The Posh'mina love Here&Now readers (& pugs!). but one lucky reader is going to WIN a Posh'mina of their own! It is a stunning scarf. Those shoes are great as well! I like it.Comes from things nice energy. You got these shorts in your swag bag??! Wow! What else was in that bag? Ok the pugs are ridiculously cute. Ahhhh!!! And so are you my friend! The scarf is beautiful. 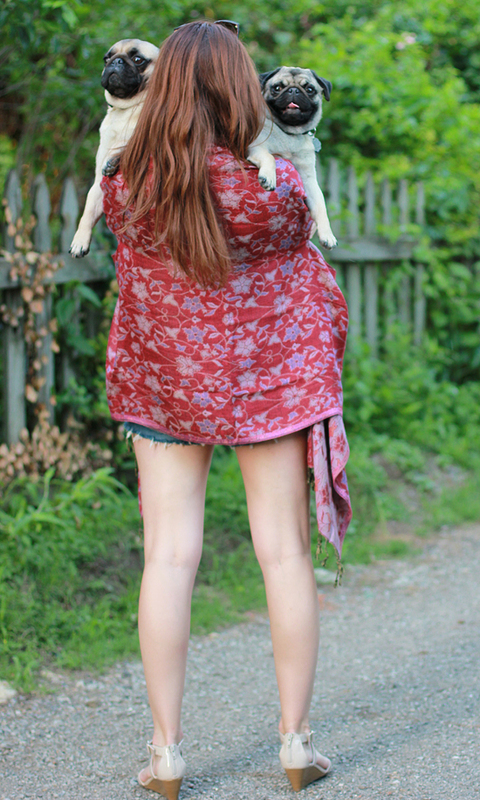 That is a gorgeous scarf and summer weekends are the best , like ever! I love how this scarf is so large that it can be used as a flowy summer top when cinched with a belt. I definitely would love to try that look!! I have a lot of plain summer dresses and I'm always chilly at night, so I would take those dresses up a notch with the Posh'mina for date nights. thank you for a lovely giveaway! I get cold easily so it would probably live in my purse to help out at church and the movies. I love the ZZ! I'd wear it with jeans and a t-shirt and ankle boots to dress up the look. I bet that would look really cute over a simple dress! aww, this is adorable!! xo thats posh'mina is so cite, great look! I am a huge lover of a good scarf. Great giveaway! I'd wear it with jeans, a camisole tank and flats. I'm totally obsessing over these shorts. They're exactly what I've been looking for! Love the scarf! It's a great look for summer. Such a pretty scarf! I'm dying over the pug photos! I think I would use it as a top itself! And as a scarf. And as a shawl in icy a/c. And as a blanket for naps! I would wear it with a floral sundress and wedges! I'd wear it with jeans & t-shirt or a sundress. It's gorgeous and I love that it has arm holes. Wonderful. If I won I'd pair the Posh'mina with black skinnies, a white tank and complimentary colored shoes. I have a perfect simple maxi tshirt dress with some flat sandals! I wear scarves all year round. great for adding something to a simple look! One of the pictures on the site shows looking like a dress, I would love to try that! I would definitely use it to dress up skinny jeans and a white tee to look put together on a casual day! I would wear it for lounging around! I love the idea of the Posh'mina scarf! Your puppies are adorable! I love that you can wear that scarf in so many ways! Around the neck down like a necklace over a military inspired dress. I love that it can be styled as a shirt, so unique! I would style the scarf with jeans and a striped tshirt. Those Posh'minas make the outfit! Thank you for offering such a lovely and generous giveaway. I would style my Posh'mina with lightly distressed ankle jeans, tank top, vintage turquoise/silver jewelry, and my favorite Swedish clog sandals. I'd style it probably something like you've done in these pictures. I would style it with a maxi dress and big earrings!! Love your look! And the photo with you holding both dogs is soooo cute!! I would utilized all the different ways to shape the scarf. Get the most of the item. I love how you can play and be creative to get so many uses! 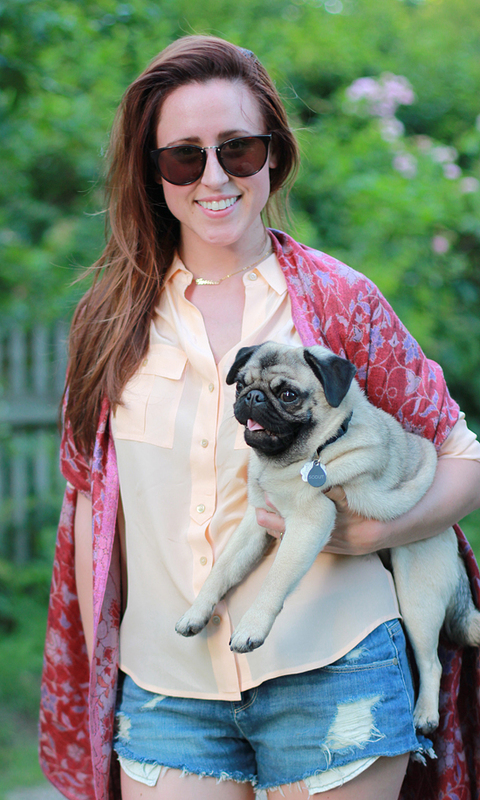 They make gorgeous scarves -- I see myself wearing it with gauzy sundresses and jeans + sweaters during the fall/winter. Dude, I was so distracted by your pugs that I barely even noticed your giveaway! Your puggies are aaaaaaamazing. I love how you can do so many things w/it. I'd wear it w/a t-shirt and jeans or maybe a nice shirt and my denim skirt. I'd wear the Lea'pard Tamed Poshmina with my navy maxi dress. It would make a great alternative to my typical cardigans! This is amazing! I would wear it with jeans and a t-shirt. It would be great for going to the movies! LOVE this! I am a scarf fanatic and this would be the perfect addition to my wardrobe! Paired with skinnies and a flowy top - summer perfection!